Manchester, N.H.: The Manchester Monarchs, ECHL affiliate of the Los Angeles Kings, are proud to announce the donation of $5,000 to the CMC Breast Care Center through the Monarchs Care Foundation, the charitable division of the team. 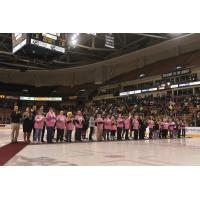 Proceeds were raised through the Monarchs' Pink in the Rink event held on February 9. "The Monarchs Care Foundation is dedicated to serving our communities through events that support awareness and financial support," said Brian Cheek, Monarchs President and CEO. "Pink in the Rink is such a great night to put the spotlight not only on breast cancer but on the people who care for all cancer patients. There was a lot of positive energy in the arena during Pink in the Rink - we hope that energy was felt that night by everyone battling cancer." "Oftentimes cancer patients feel scared and alone," says Jessica Ryan, MD, FACS, Medical Director of CMC's Breast Care Center. "There's nothing like the Pink in the Rink event to reinforce CMC's mission of health, healing and HOPE to these women and their families. The Monarchs Care Foundation's support is a reminder that nobody has to fight cancer alone." Presenting the $5,000 check to Dr. Joseph Pepe, CMC's President & CEO and Dr. Jessica Ryan, Medical Director of CMC's Breast Care Center was Monarchs President & CEO Brian Cheek and the Monarchs mascot Max (picture attached). Friday, March 15 at 7:00pm - Nets for Pets - The Monarchs teams up with the Animal Rescue League of New Hampshire to raise awareness and animal supplies for the organization. Fill up the Nets is a fun night with some very special guests that evening. Saturday, March 23 at 6:00pm - Nickelodeon & Scouts Night : Kids are encouraged to wear their favorite Nickelodeon character as they watch their favorite Monarchs players on the ice as they take on the Worcester Railers wearing exclusive Teenage Mutant Ninja Turtle inspired jerseys, PLUS - the Monarchs host Scouts from the Daniel Webster Council. Friday April 5 (7 p.m.) and Saturday, April 6 (6 p.m.) - the Monarchs finish the regular season at home as they host Community Appreciation Weekend. Game tickets are available online at www.manchestermonarchs.com . Follow the team on Twitter and Instagram: @MonarchsHockey, and like us on Facebook for additional information.